This nationally significant historic attraction has been delivering educational school programs to the school community for over 50 years. We are proud to offer you and your students some of the most outstanding educational opportunities available in the province of Ontario. BOOK YOUR EDUCATION PROGRAM NOW! For more information or to make a reservation, please contact: nathalie.canto@ontario.ca or 705-528-7694. 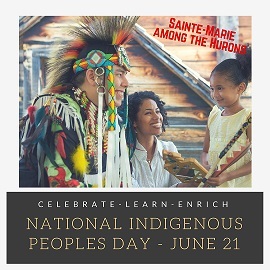 Join us on June 21 for "National Indigenous Peoples Day"! National Indigenous Peoples Day is a time for all Canadians to celebrate the cultures and contributions to Canada of indigenous peoples. Canada chose June 21 because of the cultural significance of the summer solstice and because many indigenous groups mark this day to celebrate their heritage. Price is: $12 per students, teachers and supervisors are complimentary. This free-flow program is available on June 21, from 10 am to 5 pm. Teachers will receive the program of activities and demonstrations for the day, in order to create a personalized day of activities for their students. Come join us on the historic site to celebrate the contributions of Indigenous Peoples to Canada! Tours of the historic attraction, along with education programs, offer interactive activities that correspond in the development of learning outside of the classroom. All education programs at Sainte-Marie link with the new Ontario Curriculum which came into effect September 2018. In addition to relevant content, programs make use of the Concepts of Disciplinary Thinking such as Continuity and Change and Cause and Consequence. At Sainte-Marie students have the opportunity to engage in Social Studies and History in a way that gets them thinking about people, places, and ideas. Our skilled and experienced interpreters will teach and engage your students through exploration, story-telling, lively discussion, comparisons, and “hands-on” activities. They like kids and they love history. Their mission is to connect your class to the past, in a spirit of discovery and fun. We offer half-day, full-day and winter programs to suit your teaching requirements. Programs can also be tailored for Secondary School levels and English as a Second Language students. A lunchroom has been designed especially for students bringing their own lunches. This bright and modern open concept facility accommodates 75 students and is wheelchair accessible. It is equipped with hand-washing stations, a juice and water vending machine, and knap-sack storage. Discovery Harbour, located in nearby Penetanguishene, also offers enhanced education programs. Please refer to www.discoveryharbour.on.ca for more information on Discovery Harbour education programs.